My 7 year old decided she wanted to get her ears pierced. It was first raised quite a number of months ago but I dismissed it saying she was too young. I’m definitely not the type to be piercing a baby’s ears but each to their own. Maybe when she was older – and she could pay for it by herself. I knew I wouldn’t be able to resist long term. I got my own ears pierced aged 7 too. I used my First Holy Communion money. I tried to play that card, suggesting she gets them done after her Communion knowing the age for the event has increased by a year since my time. But, since she turned 7 at Christmas and accumulated enough money in gifts she began her campaign. She is quite persistent – I’ll give her that. A trait my own mother says she has most definitely inherited from me. I guess this is where the karma bites you on the backside! Payback for the years of tormenting my parents stretch out ahead of me. It is barely over six weeks since her birthday! We managed a measly six weeks and finally caved last Friday. Despite the numerous Claire’s Accessories vouchers she got between Christmas and her birthday (thinking that’s where she would eventually get it done) we ended up bringing her to our local Life Pharmacy. It was a lot cheaper and I figured there was some medical awareness there as opposed to getting the ears pierced amongst One Direction merchandise. The pharmacy had a consultation room which could have passed as a Doctor’s office. She was excited but nervous as we made the journey in. She brought her American Girl Doll – the birthday present from us – as morale support. She picked her earrings and the preparations got underway. Her ears were cleaned, the equipment prepared and marks placed on her ears. I was asked to approve the placement and asked for a little adjustment. Once ready to start they called in a second piercer. A genius idea they give you the option to get both ears done simultaneously. One too many sine pierced ears from kids refusing the second shot! They didn’t even tell her they were about to do it. I mean she knew it was imminent as they picked up the guns but there was no “right here we go!”, no countdown – nothing. They just clicked, bang and said right you are done. Hey presto two pierced ears. My little lady looked a little shell shocked but pleased as punch! She got her after care instructions and paid her dues and away she went. As I looked at her ears I couldn’t help thinking I was wrong to ask them to amend the position. Although maybe I’m being paranoid – my husband, mother and most importantly my daughter think they are just fine! Now I’m sure she will be hounding me for something else! And my two year old announced she wants her ears pierced at age 4! What do you think of kids getting their ears pierced? Love it or hate it? My 7 yr old gas been asking me for ages, I’m not a huge fan but will let her in time. I put her off for the moment explaining how painful it is…mean of me I know but so far it’s worked! Lol! My 7 year old was having none of it! Loads of her classmates got it done and she had a full run down of what was going to happen and how it felt. I think she even held back tears to make a point!! I am so weak and crumbled! My plan at the moment is to suggest 12 and be willing to be beaten down to 10, but at the moment my 5yo has no notion of such a thing, so who knows when she’ll start asking. She has noticed some of the little girls she knows who do have pierced ears and asked me about it and I just say that’s something some families do early but we don’t. I was 15 and was meant to wait till 16 but I headed into town with the encouragement of my Spanish exchange student and did it anyway. At that age there wasn’t much they could do about it. A pharmacy seems like a good choice. I’ve read articles advising that you actually go to a professional piercing parlour (like, tattoos and stuff) because apparently sometimes Clare’s and the like can be not such a great place to do it. They look lovely on her!!!! I had my ears pierced as an infant!! As did all of my sisters. My aunt used to take us as my mother couldn’t do it. The mind boggles at that one. Also my Dad used to go mental over it. So there’s me and my 6 sisters. Youngest sister didn’t get hers pierced until she was a teenager. She and one more wear ear rings only. I think it is perfectly ok for the child to decide if they want to have them pierced. I was discussing this with a friend today – we both know people who have seven year olds who got their ears pierced recently, and we both thought it would be years before our six year olds would look for it, but what’s the bets were completely wrong about that! office mum recently posted…Do women really need to act like men? They never forget the promises!! Good luck with it! My daughter has been asking since she was 4 to have her ears pierced. 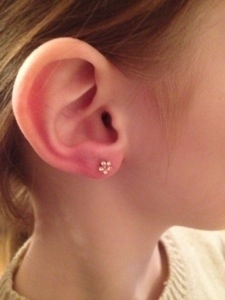 I told her then that would she could have them pierced when she was 8.That is next February, and already dreading it. My husband is totally against it but I don’t really mind. I think pretty flower ones that your daughter had are lovely though.